Boy, I just hate to have one of these pages. But sometimes mistakes happen. If you think there is a problem with any Ë Whirligig Designs Ë patterns and you don’t find a correction below, please contact me. Bloom Tulip: The cutting instructions for the cream background and pink should read: “Cut 1 - 4 1/8” strip WOF. From strip, cut 4 - 2 1/4” x 4 1/8” rectangles.” Remaining instructions are the same. Bobbers: The piecing instruction for the second step under Block #2 (on page 2) should read: Subcut each strip set into 21 - 2” segments (total of 42 segments from each combination). Bloom Morning Glory: The cutting instructions at the bottom of page one should read: “From remaining medium fabrics (4) - cut 1- 2” strip WOF. From strip, cut 8 - 2” x 4 1/2” rectangles. Twist and Shout Block: All squares that are patch (A) should be 3 3/8” x 3 3/8”. Call of the Wild: The yardage requirements for the large quilt for the Blue Marble should read 3/4 yard and for the Tree Print should read 1 1/8 yards. The cutting instructions on page 1 for the Cream (Pieced Block Sky) should read: “Trim remainder of strip to 3 5/8”+. From strip, cut 3 - 3 5/8”+ squares. Block 8: In the quilt diagram, block #1 and block #2 should be switched. Teacher’s Pet: Page 3 - 4th step from the top (black marble strips): The instructions should read: Cut 2 pieces 64 1/2” long and sew to top and bottom. Sweet Baby - Jayne: Fabric Requirements: You will need 1 1/4 yards of the stripe fabric. What’s New at the Zoo? : Cutting instructions for the variety of fat quarters should read - From the remainder of 2 fat quarters, cut: 6 – 3/4” x 3 1/2” rectangles and 6 – 3/4” x 4” rectangles. Piecing instructions in step 2 should read - Sash small pictures (3 1/2” square) using the 3/4” x 3 1/2” rectangles and 3/4” x 4” rectangles from the assorted fat quarters. Smokey River: You will have extra pieces when you cut giving you a little more variety in your blocks. Choose your favorites! 1 – 2 ½” x 16 ½” rectangle, 1 – 2 ½” x 6 ½” rectangle, 5 – 2 ½” squares and 2 – 2 ½” Easy Angle™ triangles. Some of the block diagrams are incorrect for placement of the corner units. When arranging the corner units in the blocks, make sure the dark squares look like the block diagrams. The 2 1/2” x 4 1/2” light rectangles will not look like the diagrams, but that’s okay! You do not need to remake the corner units! Simon’s Landing: The cover photo is computer generated and is for the lap size quilt only. Your quilt will vary slightly from what is shown. The overall look will remain the same. The large block in the center of the quilt diagram at the bottom should be labeled A, not B. B and C in the diagrams so you can fussy cut some of the smaller (4 1/2”) squares for more variety. Happy Jack: The second bullet in the instructions on page 3 should read: Arrange 2 ½” x 3” background rectangles, a 3 ½” center square, and 2 each of Unit A and B as shown in block diagram. The corner rectangles in the adjacent diagram should read 2 1/2” x 3”. Stacks³: Cutting for the Dark Brown Fabric should read: Cut 15 - 4 1/4” strips WOF. Heritage Square: Block #11 - page 25. The cutting instructions for the Background fabric for the 103” square size should read: Cut 4 – 2 ¼” strips WOF. From each strip, cut 2 – 2 ¼” x 12 ½” rectangles (11C) and 2 – 2 ¼” x 9” rectangles (11D). The list of fabrics on the cover should also include: Large Tree Print ………………….. 1/3 yard. Cut 2 – 3 ¾” strips WOF. From strips, cut 4 – 3 ¾” x 15” rectangles for the large trees. 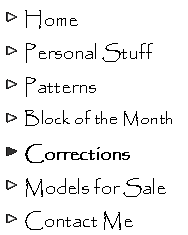 Cut 2 rectangles on the right diagonal (TL-L) and 2 rectangles on the left diagonal (TL-R). The 2nd bullet in the instrutions for making the medium trees on page 4 should read: Tree block should measure 5” x 9 1/2” . The second bullet in the instructions for making the small trees on the bottom of page 4 should read: Make 2 of one small tree print. Make 4 of each of the remaining small tree prints for a total of 10 blocks. Granite City: The fabric yardage for Fabric #11 for the 102” x 102” size should be 3 yards. The cutting instructions on page 38 for Fabric #11 (102” x 102”) should read: Cut 12 - 3 1/2” strips WOF. From strips, cut 80—3 1/2” squares (13E) and 88—3 1/2” 45HST triangles (13F).